Below is one of many photographs that have been submitted to the Flora Atlas. 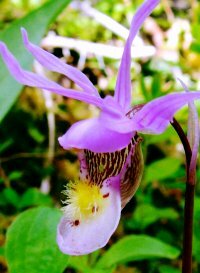 The New York Flora Association is an organization dedicated to the promotion of field botany and greater understanding of the plants that grow in the wild in New York State. Ours is an independent non-profit. It is funded largely by dues and gifts but may also accept grants. For more information visit our website. Help gather distribution data for the Atlas! Support the NY Flora Atlas! The New York Flora Atlas is a source of information for the distribution of plants within the state, as well as information on plant habitats, associated ecological communities, and taxonomy. In addition, users can learn about the location of vouchered specimens and see images to get a better visual for each plant. The next step is to create a Manual to the New York State Flora. Early efforts are underway to move towards this goal.